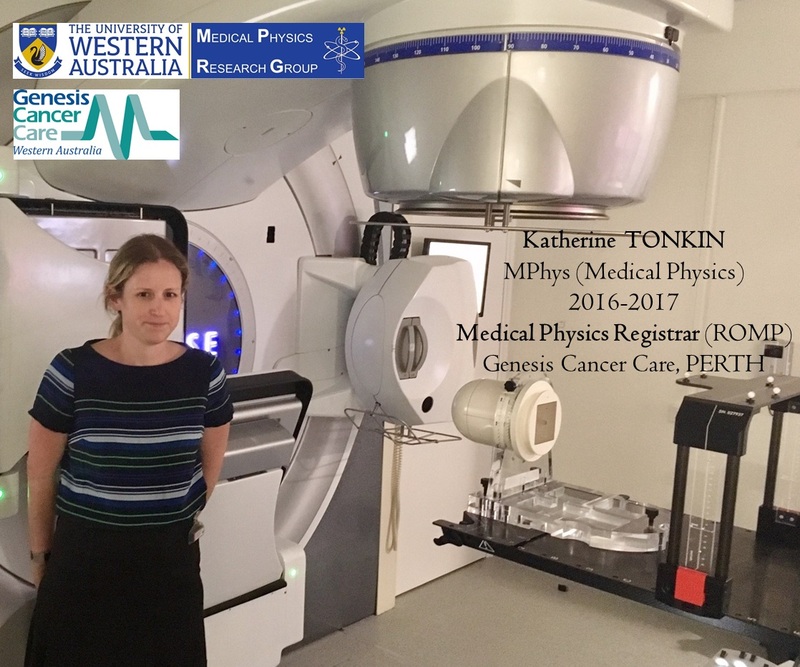 Katherine started her Master of Medical Physics at the University of Western Australia (UWA) in 2016. Her research project was on “A Treatment Planning Study of Low Dose Radiation Therapy for the Adaptive Response” supervised by Adj/Prof Martin Ebert, and Medical Physics Specialist Mr. Simon Goodall. The project was carried out at Genesis Cancer Care, Perth. Katherine has answered a few questions about her experience at UWA. 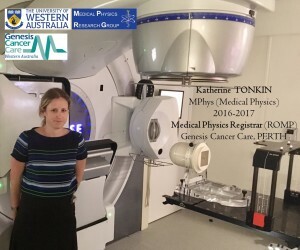 My name is Katherine, I graduated from UWA with a Masters of Physics (Medical Physics) in July 2017. I am currently employed as a radiation oncology medical physics registrar at Genesis Care WA. As a registrar my time is divided between acquiring the training and knowledge necessary to complete the Training, Education and Accreditation Program (TEAP) to become an accredited medical physicist and assisting the department in providing day to day medical physics support to users of medical radiation. UWA was a great environment for study, through the Physics department I had the opportunity to participate in a research placement at Nanjing University in China. Lecturers were very approachable and willing to go above and beyond their job description to help you understand the subject matter fully. • Medical physics allows you to be involved in researching and implementing new techniques. • Medical physics allows you to use problem solving skills to analyse results and diagnose problems. • You are contributing in a meaningful way to society. My masters project was a treatment planning study of low dose radiation for the adaptive response. The goal of the project was to evaluate if current clinical equipment and planning systems could produce plans of an acceptable quality to deliver a low protective dose of radiation to patients prior to their treatment. Take the time to learn a little about the field before you begin the course, it will allow you to choose a research project that will complement your career path. Attend the weekly physics meetings and try to present regularly, the team will give you input that may lead you down a path you wouldn’t have considered otherwise. Multiple studies have shown cells exhibit an adaptive response when exposed to low dose radiation. The low dose radiation acts to protect them from subsequent exposure to high dose radiation and has the potential of being exploited to improve the therapeutic ratio of radiotherapy treatments. Designing a treatment that will deliver low dose radiation to protect normal tissue surrounding a tumour from high dose exposure during treatment is the subject of this study. The treatments are planned to deliver a low dose of radiation to organs at risk in the proximity of the tumour, maintaining a high dose gradient to the tumour tissue to minimise any adaptive response in the tumour. The plans were then delivered on a clinical linear accelerator to verify delivery was possible. Forward and inverse planning techniques are explored in this study and plans are created for a range of tumour and target sizes to explore the optimum treatment. Inverse plans were designed for a VMAT delivery and it was expected mechanical limitations of the linear accelerator would affect plan quality. Plan quality was affected by machine limitations but only at larger target sizes, inverse plans showed good coverage of dose to the target but an increased minimum dose to the tumour when compared with forward planning techniques. Delivery verification showed good agreement with planned dose calculations in almost all plans delivered.